Like some of the other pioneering British car manufacturers, Riley had been previously been involved in the manufacture of bicycles. It was in 1898 that the first Riley car,the single cylinder voiturette designed by Percy Riley, appeared on the roads of Britain. More were to follow of course but without doubt the glory days for Riley were the 1920’s and 30’s during which time the company earned a worldwide reputation as the manufacturer of fine, fast, and stylish cars, and the famous Riley Nine of 1926 went on to achieve great success in motor sport in the hands of drivers such as Freddie Dixon. In 1938 Riley became part of the Nuffield group of companies, and after the end of the Second World War Riley moved from Coventry to Abingdon, close to the MG car works. The Nuffield group of companies, the founder of which was of course Sir William Morris, was to later become BMC - the British Motor Corporation. 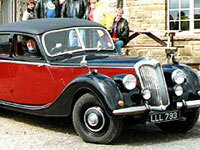 The most well known and desired Riley’s of the post war period were the RM models. The1 ½ litre RM saloon was launched in 1945 and was joined by the 2 ½ litre model in 1946. As well as a saloon version of the 2 ½ litre car there were also drop-head coupe & roadster versions produced from 1948 to 1950. In 1953 the 2 ½ litre saloon ended production and was replaced by the Pathfinder saloon which was the last of Riley models to use the well known 2 ½ litre engines for which the original design dates back to 1926. The 1 ½ litre RM however remained in production until March 1955 although its bodywork had undergone a restyle in 1952. The Pathfinder was replaced by the Two-Point-Six saloon in 1957 and this was the first Riley to use a BMC engine - the 6 cylinder “C Series” unit. During the years to come, as with all other marques now under the BMC umbrella, “badge engineering” was to rule. This was where the different marques owned by BMC were distinguished from each other only by styling differences such as badges, external and interior trim, and sometimes slight changes in engine performance. The Riley variants were mostly fitted with twin carburettor engines, walnut fascia’s and other refinements and were therefore higher up the “BMC hierarchy” of badge engineering. The last Riley’s the 4/Seventy-Two and the Elf, rolled of the production line in October 1969. These had been based on the Austin Cambridge/Morris Oxford and the Austin/Morris Mini respectively. The Riley Pathfinder was introduced in 1953 as a replacement for the RMB / RMF series of cars. It had at first been tagged as the RMH but was renamed to Pathfinder before its launch. The newly designed Riley 1½ litre RMA saloon was introduced in August 1945 with the 2½ RMB saloon following in November 1946.